The Key Largo woodrat (Neotoma floridana smalli) is a subspecies of the Florida woodrat existing only on the island of Key Largo, Florida. It is one of the most endangered rodents on earth, but the good news is that it is making a comeback with the help of dedicated conservationists. The woodrat became endangered due to a combination of habitat loss and predation by feral cats. Development on Key Largo since the 1920’s (and especially since the 1980’s) led to a reduction in the woodrat’s natural habitat, the tropical hardwood hammocks of Key Largo. The current habitat is half what the original was. 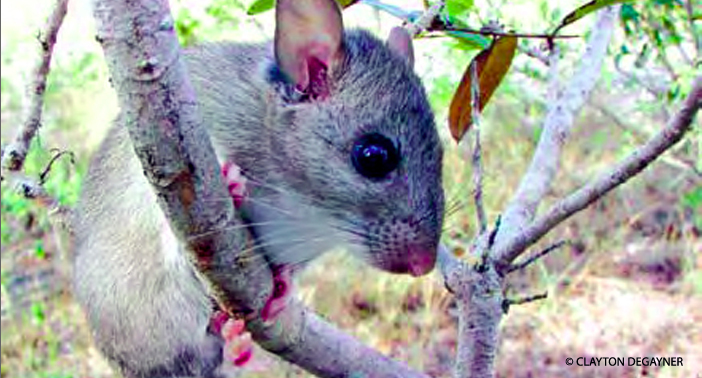 In addition to loss of its habitat, the woodrat suffered because large numbers of domestic cats were abandoned by their owners and left to breed on Key Largo. At this time there are still about 500 feral cats living on the north side of the island and 100’s more in the south. The cats are concentrated in special shelters constructed by feral cat advocates. These shelters are called Trap, Neuter and Return colonies­, or TNR for short. They are a way of dealing with feral cats. These cats were born in the wild and do not domesticate. Lovers of cats want to keep them alive, but also prevent them from increasing in numbers over time. These studies included recruiting and training a young biologist from Australia, Joanne Potts. With help from Dr. Savage, she entered a Ph.D. program studying new monitoring techniques for the wild population through Prof. Steve Buckland and Dr. Len Thomas at the University of St. Andrews, Scotland. It was during this time that volunteer researchers discovered the full extent of feral cat predation on woodrats. Up until this time, scientists mistakenly believed that various wild predators were eating woodrats and that feral cats were only a part of the problem. Captive­bred woodrats released into the wild carried little tracking collars that would indicate when they died or were killed. This was part of the effort to understand what factors were affecting the species survival. Volunteers kept finding collars buried with the bowels of the deceased rodents and decided to check with several zoos to determine if this was a feline behavior pattern. Word back from the zoos confirmed that cats, both big and small, do not eat the bowels of their prey, but neatly bury them. This pattern repeated over and over again with the captive­bred woodrats released to the wild. Despite these setbacks, efforts prevailed. For the first time in years, the large stick nests of the woodrats started to reappear in breeding areas. These nests can be up to 6 feet wide and 4 feet high. They are clear evidence that the woodrat population is breeding and growing again. Keeping cats away from woodrat populations is crucial because the woodrat natural habitat, according to Clayton, is only ten miles wide and the home range of a cat is 5­7 miles. Not only did removing feral cats act as a boon to woodrats, but wild birds are also increasing in these areas. Wild rabbits have returned along with their natural predators, owls! So the whole Key Largo ecosystem is making a comeback. And it’s an important lesson in conservation for several reasons. It shows how introduced predators like cats can devastate an ecosystem and that this doesn’t have to happen. People can choose to keep pets inside and to spay and neuter their pets. People who love cats can take their love of animals to the next level and work to preserve our natural world. It’s a fact that cats and other introduced predators have caused waves of extinction over the islands of the world,­ including the island continent of Australia and its unique wildlife. The other lesson, of greater importance, is that a small group of dedicated persons, even volunteers with little scientific training, can help turn around an extinction event just by persisting in intelligent efforts. In Clayton’s words: “We are doing what we can so our grandchildren can some day see a Key a Largo woodrat!”. Learn more about endangered species where you live and how you can help get involved! 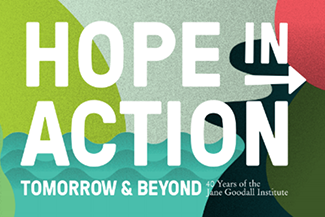 Jane Goodall is a passionate road warrior, traveling nearly 300 days each year on a worldwide speaking tour to raise awareness, inspire change, and encourage each of us to do our part in making the world a better place. Jane's love for animals started at a young age and in July of 1960, at the age of 26, she followed her dreams and traveled from England to what is now Tanzania, to bravely enter the little-known world of wild chimpanzees. She was equipped with nothing more than a notebook and a pair of binoculars, but with her unyielding patience and optimism, she won the trust of the Gombe chimpanzees, and opened a window into their lives for all to see. Jane's studies has taught humanity one of the most important lessons - that we humans are not the only beings on this planet with personalities, minds capable of thinking and above all, emotions. Her findings shook the scientific community and made us re-evaluate what it means to be human. thats the oldest trick in the book!